They looked around, mouths agape. It isn’t often that one gets to spend the night in a church that has been abandoned for 300 years. Stone walls towered above them. Birds flew in and out of windows that no longer held glass. They walked further into the structure, the stones crunching beneath their feet. Hard to believe pilgrims get to spend the night in this amazing place. And I get to stay for two weeks! I invited them into the kitchen, where I gave them water flavored with lemon and mint (from our herb garden). I learned Antonio only spoke Spanish. Flora, who didn’t know Spanish, spoke to him and her native Italian and they got along just fine. Thankfully, she also spoke English. 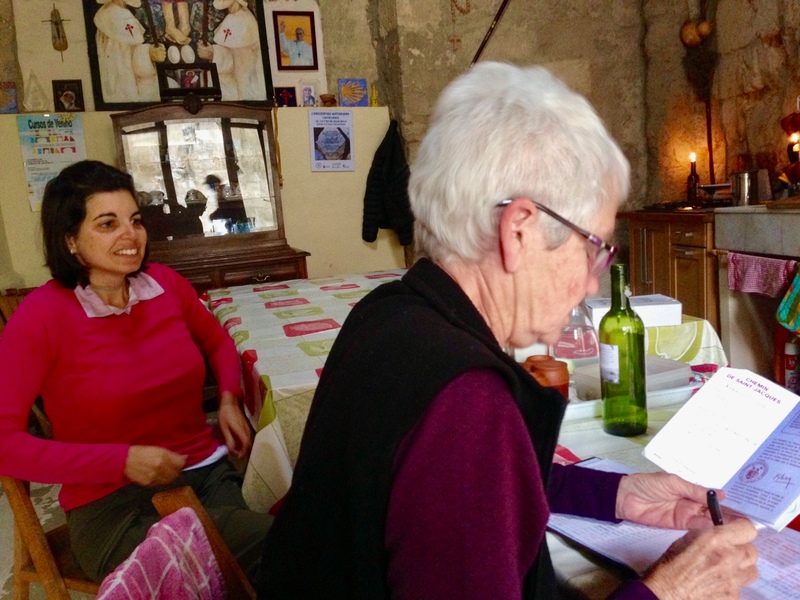 My first time getting checked in as a pilgrim in San Antón: September, 2015. Steffano making breadcrumbs with our stale bread. I took our first guests down to the picnic table by the gates to meet Stefano. After exchanging pleasantries, Antonio asked if there was a place nearby to purchase food. Stefano explained that the only place to do so was in Castrojeriz, 3 km away. Antonio declared that he wanted to cook Spanish tortilla for us tonight. “We have eggs and potatoes,” Stefano said, knowing the ingredients of the popular dish. Antonio thought for a minute and then asked about our potato supply. I slid back the curtain in front of our shelves and showed him the four potatoes sitting on the bottom shelf in a plastic crate. “And you have an onion,” he said, seeing it behind the potatoes. “That will be good. But I may need more eggs.” (Especially since, on any given night, we have no idea if we will have two pilgrims or twelve, or anywhere in between.) Despite the 90° temperature, Antonio shrugged his shoulders when Stefano reminded him it was 3 km further down the road. Antonio pulled a small day pack out of his larger backpack, and promptly took off. Two hours later he returned, pulling his purchases out of his pack. A red pepper, green pepper, tomato, and then a half-carton of eggs dripping with the insides of the one that didn’t make it. We all laughed. And then Stefano and I asked him how much it cost so that we could pay for the ingredients. Antonio went on a long rant about how cheap things were in this part of Spain. And that this was his gift to us. 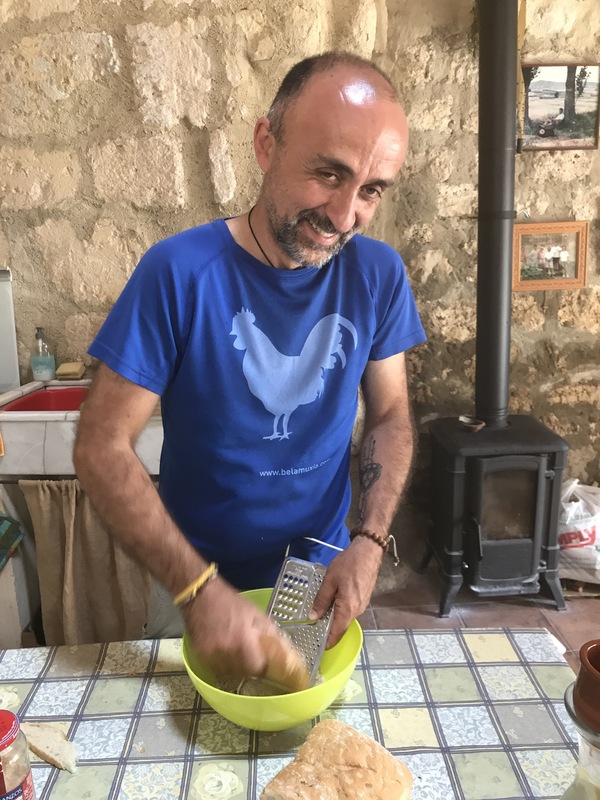 Though Stefano and I had only been hospitaleros for two nights, and therefore had to cook only two dinners so far, we were still delighted to have someone else take over the cookhttps://www.youtube.com/watch?v=6vy9ulaolqcing duties. 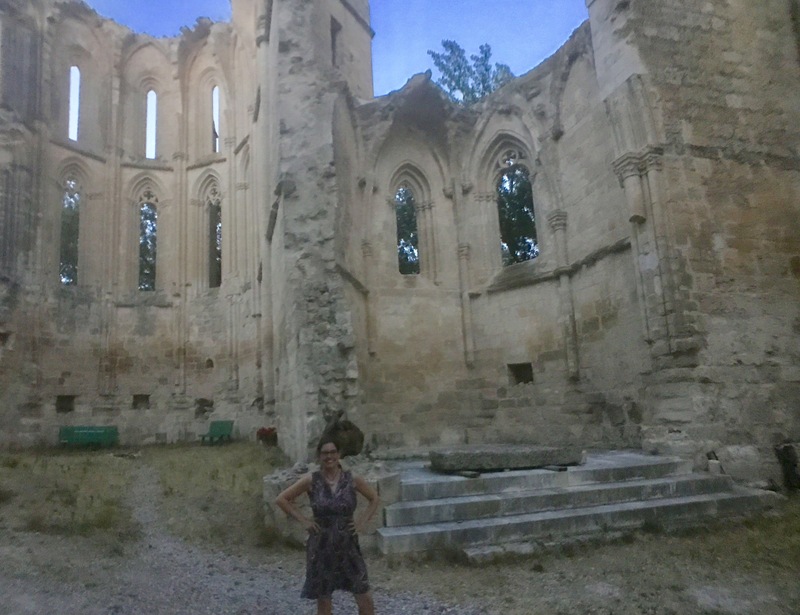 For a video tour of the ruins at San Antòn, click here. 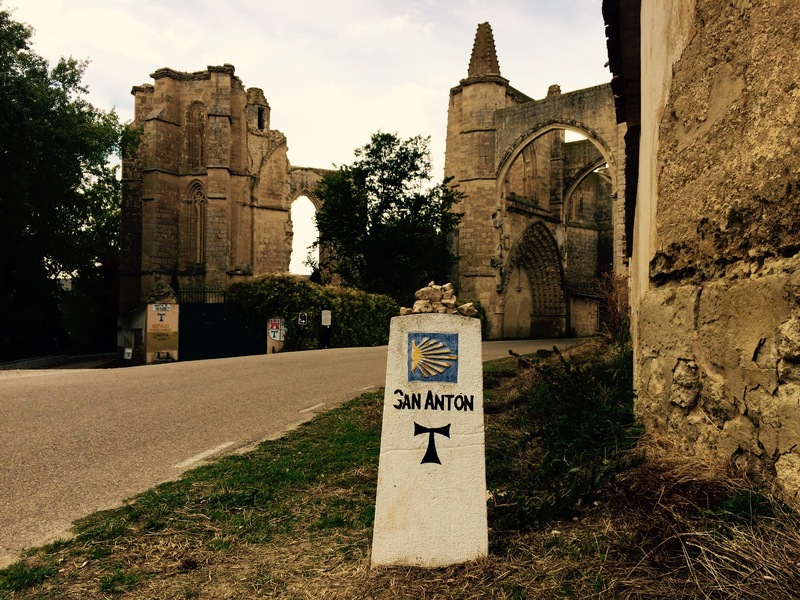 Can’t wait to stay at San Anton next camino!